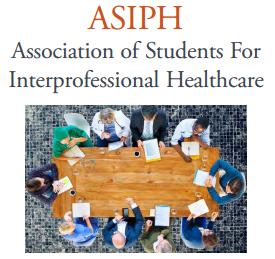 Carlos Pérez Aldana, a SBMI Ph.D. student, has been nominated and elected as the new vice-president of the Association of Students for Interprofessional Healthcare (ASIPH). Currently, he is serving as Interim President. A publication co-authored by Professor Dean Sittig, Ph.D. was selected for the 2016 International Medical Informatics Association's yearbook as one of the best papers in human factors and organizational issues. The paper titled “Measuring and improving patient safety through health information technology: The Health IT Safety Framework” is available online. Be able to provide a brief presentation of the process of the degree seeking program to the board toward the end of the fiscal year. The application deadline is April 17 and students can visit the Houston HIMSS Chapter website to get more information and apply. The UTHealth Center for Interprofessional Collaboration (CIPC) has launched registration for the spring 2017 Interprofessional Team Training workshop. The four session workshop is designed to enhance a student’s ability to function in interprofessional health care teams. All UTHealth students and alumni are welcome to attend the free workshop. The sessions will take place at UTHealth School of Dentistry, Fullerton Classroom (SOD 4310) on Thursdays from April 6 to April 27 5:00 to 7:00 p.m.
Visit the CIPC website for more information. The online registration deadline is March 31. SBMI Professor James Langabeer, M.B.A., Ph.D. will moderate a panel on April 12 titled “Population Health: What is it?” at the UTHealth School of Public Health. Four leaders from across Texas will come together to define the concept of population health and offer strategies and solutions. The panel will take place from 11 a.m. to 1 p.m. on Wed., April 12 at the School of Public Health (1200 Pressler Street Houston, TX 77030) in the first floor auditorium and all are invited to attend. The Second Annual TMC Biodesign Hackathon will take place Mar. 31 - April 2, 2017 at the TMC Innovation Institute. Selected participants will hear problem statements and collaborate with a multidisciplinary team to build a solution over the course of a weekend. Teams will be mentored by TMC Biodesign Fellows, industry experts and leading TMC clinicians during the hackathon. The event is by invitation only so apply online if you are interested in participating and contact tmcbiodesign@tmc.edu for more information. The Center for Precision Health, a joint venture between the UTHealth School of Biomedical Informatics and School of Public Health, invites you to attend its first Precision Medicine Day on April 13 at Fayez S. Sarofim Research Building (1825 Pressler St, Houston, TX 77030) from 8 a.m. to 2:30 p.m.
Join national leaders and UTHealth experts to learn how precision medicine is integrating research disciplines and clinical care in guiding individualized patient care. This event aims to foster peer-to-peer networking and provide opportunities to explore collaboration endeavors with other researchers, participating guests, and external partners who are working to bring precision medicine to the forefront of healthcare. Experts will talk about recent advances in precision medicine followed by a poster session highlighting innovative research in precision medicine. Please visit the Precision Medicine Day website for more information about registration and the event schedule. SBMI students are invited to join the UTHealth Obesity Health Interest Group. The multidisciplinary student interest group is sponsored by The Obesity Health Consortium. The group prepares students to treat the most prevalent chronic disease in the United States and provides an opportunity for leadership and collaboration with students across multiple disciplines while they learn more about treating patients with obesity. For more information, contact Katie Duncan, Obesity Medicine Fellow, at Katherine.Duncan@uth.tmc.edu. SBMI Associate Dean for Academic Affairs and Associate Professor Susan Fenton, Ph.D. was interviewed for a “For The Record” magazine article on the growth of the data scientist role in healthcare. (7440 Cambridge St. Houston, TX 77030), 4 p.m.